We are delighted the inimitable Gary is back in harness at Retro Music Snob after an eight-month hiatus. Here are some highlights from what we found there last night. Wednesday Week - Missionary - Retro Music Snob - a personal favorite from the late 80s; I've got the vinyl, too, Gary, and a cassette! A perfect song. Leg Tail Leg Edition: Teenage Head, Girls, Ettes, Monolators, Upsidedown, Telepathic B's, TBRP, Head of Femur, Bellfuries, Marching Band, et. al. . .
One more time, in case we still have visitors. (Hopefully you haven't noticed our recent AWOLitude.) Here's what we've been up to. How 'bout youse? The Girls - Transfer Station mp3 from Yes, No, Yes, No, Yes, No - Thanks to Pitchfork. The Ettes - Marathon mp3 - off the forthcoming release Look At Live Again Soon - Thanks to Alyssa Kleven at Vitriol Independent Promotions. 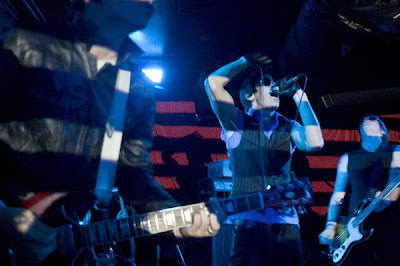 The Upsidedown - Silver Wind mp3 - They'll be supporting The Dandy Warhols on their upcoming fall tour of North America. You might notice sonic similarities. The Telepathic Butterflies - Telescope mp3 - from Breakfast in Suburbia - Rainbow Quartz has another sample here (plus samples from other TTB albums). Not Lame has more samples and purchase info here. The Broken River Prophet - This Gaping Wound in My Chest Is Like Reading Your Diary Out Loud mp3 - I'm kind of a psucker for this psychy Byrdsy pstuff. Psychic Stunts - Speaker's Block mp3 - from their 101 Pick Up Lines EP - Thanks to the wonderful Estogang over at microlips. Further contrition: We regret we ran out of room to include the last period of the ellipsis in the postitle (not to mention Plushgun and Psychic Stunts). Sheesh.